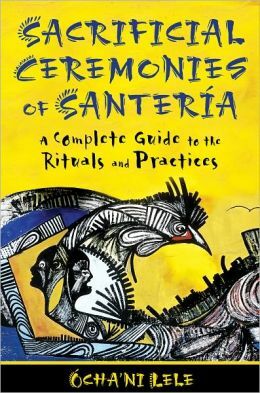 In this book, Santero Ocha’ni Lele explains the reasons and behind animal sacrifice in Santeria. Written in equal parts journalistic/academic style and personal account, Lele gives clear historical and political context for the development of Santeria and explains how ancestor worship factors into animal sacrifice. The account is thorough and gives the Santeran side of conflicts over sacrificial practices. He even digs into Santeran folklore, providing a complete context for these practices. To appreciate Lele’s powerful writing, the reader may need to check instilled reactions. Sacrifices in Santeria are not for sport– they are food and gifts, power for the powerless. Ancestors, to these believers, need feeding. The frank discussion of sacrifice and racial history can create some much-needed discomfort for the average armchair tourist. If curious enough to look at this review, but ardently committed to animal welfare as an absolute, take this away from the book: your cat is safe.